Smiting terrible noetic demons in the loins. Around the year 324 A.D., three men came to Saint Pachomios in Tabennisi to follow him, that is, Psentaesi, Sourous and Psoi. They said to him, "We want to become monks in your company and to serve Christ." He talked with them to know whether they would be able to renounce their parents and follow the Savior. Then he put them to the test and, having found that they had the right intentions, he clothed them in the monks' habit and received them as his companions with joy and God's love. Once they had joined the holy community, they gave themselves over to great exercises and many ascetical practices. They saw him laboring alone in the work of the monastery, whether tending the few vegetables or getting their food ready; or if someone knocked at the door of the monastery, it was again he who went to answer it. If any of them was sick, he ministered to him until he got well, telling himself with regard to his three companions, "They are neophytes who have not yet attained that stage which would allow them to serve each other." Therefore he exempted them from any labor, telling them, "For your salvation endeavor to hold fast to that which you have been called." In return they said to him, "We are saddened, O our father, to see you wearing yourself out alone in the monastery." He replied, "Who yokes his beast to a water wheel and does not care until it falls down and dies? So then, if the Lord sees that I am tired, he will send us some others able to help us in every good work." In fact he established for them an irreproachable cenobitic life-style and traditions profitable for their souls in rules which he took from the holy Scriptures: absolute equality in their clothing and food, and decent sleeping arrangements. And so speaking the word of God to them, Pachomios edified them and led them to the zeal of good works. And even when he kept silent, they saw his conduct and it was for them a beneficial word. 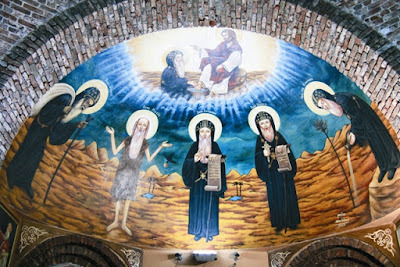 They marveled and said to each other, "We used to think that all the saints were made holy and unswerving by God without regard to their free will, from their mother's womb, and that sinners were not able to have life because they had been created that way. But now we see the goodness of God manifested in our father who, although born from pagan parents, has become to dear to God and has clothed himself with all God's commandments! Then we, too, and all men can follow him, for he follows the saints. So is realized what is written, 'Come to me all you who labor and are overburdened and I will give you rest.' Let us die with this man and we shall also live with him, for he guides us straight to God." Around the year 336 Saint Pachomios began to appoint his disciples as superiors of various monasteries. Psoi was among those who were found to be strong in spirit and true athletes of Christ that led one of the monasteries of Pachomios. We are told that he reposed while he was in a state of prayer.